When clips have been created from a video file using Split Video, you may want to re-combine some of them into a larger clip, which can simplify editing operations like cut and paste, and which lets you add effects, narration or music without worrying about stretching them over several shorter clips. To combine clips, select them all, and right-click on any of the selected clips. Select Combine Clips from the menu. 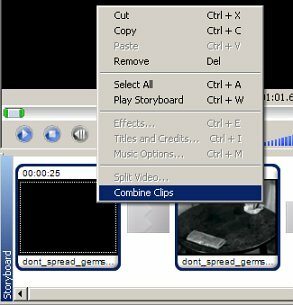 The clips you have selected will be combined into a single clip, which can then be used like any other clip on the Storyboard: dragged, copied, effects added, etc. Only clips that are sequential in the original video can be combined. For instance, if you have detected three scenes in a video file, and put all three on the Storyboard, you could combine 1 and 2, or 2 and 3, but not 1 and 3. The clips must also be next to each other on the Storyboard and in the correct order to be combined.